Has the moment to buy a new car seat finally arrived? Whether you’re a first-time parent or your growing toddler will soon need to transition to the next car seat stage, ensuring your child’s safety is your number one priority–and deciding on the best seat for you and your needs isn’t always easy. To provide some guidance to parents making this critical purchase, we’ll be taking an in-depth look at the best car seats that will take your child from birth to their toddler years and beyond in this review roundup. Read on for our top picks for infant car seats, convertible car seats, and booster seats. Infant car seats are designed to transport fragile newborns, whose delicate bones and muscles require special protection. These rear-facing seats are used from birth until your baby reaches the height or weight limits of whatever seat you use, which is somewhere between 22 to 35 pounds (though this can vary depending on the brand). The American Academy of Pediatrics, or AAP, now recommends that children stay in rear-facing seats as long as possible, changing their previous recommendation of two years. Manufacturers are responding by designing seats with weight limits of 35 pounds and up, allowing for rear-facing seating that will accommodate most kids beyond two years. Once your child has reached the height and weight limit for their infant car seat, they transition to a convertible or a front-facing seat for toddlers. Infant car seats come with a base that you leave installed in the car, and the baby’s seat, which clicks in and out of the base. Being able to detach the car seat from the base easily is an essential feature of any infant car seat as it allows you to move baby from the car to your house easily–or wherever you’re going–and vice versa. Some models allow you the ability to click directly into a travel system stroller, which is a handy feature for families that do a lot of walking, like city-dweller families. If this is important to you, search for compatible car seat and stroller systems. If you’re going to be moving the seat in and out of the car frequently, you’ll want a model that offers excellent portability, and that’s easy to attach and detach. You may also want to look for a newborn car seat with a removable cover (because let’s face it, babies can create some big messes), and make sure the seat is sufficiently padded for maximum comfort. Now let’s take a look at our top choices for the best infant car seats. 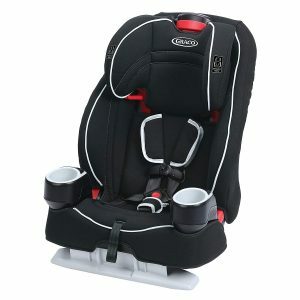 The Chicco KeyFit30 Infant Car seat is one of the top selling models on the market, which comes as no surprise to us. Because it offers excellent safety and ease-of-use at an affordable price, we’ve chosen this seat as our top overall infant car seat. Parents love this seat, and with good reason. Everything about it is carefully designed for the user, from how easy it is to install to how simple it is to take it in and out of the car. Plus, we love that the KeyFit30 is compatible with all Chicco strollers, as well as many other stroller models. The base is straightforward to install, which parents like. Pulling on one tightener in the middle straps it securely in place, and the unit includes a level that makes it simple to see if the seat is positioned correctly. The KeyFit 30 utilizes a five-point harness system with tangle-free straps and makes that reassuring “click” sound that lets you know that you have correctly inserted the carrier into the base. The Chicco KeyFit30 meets ASTM standards and Federal Motor Vehicle Standards, though the FAA has not approved this particular model for air travel. If you know you’ll be traveling by plane with your newborn baby, you may want to consider a different car seat. The Graco SnugRide 35 made our list thanks to its reasonable pricing, lighter design, and higher weight profile, which will allow you to get more use out of this car seat. Additionally, if you’re looking for an infant car seat that’s suitable for petite babies or lighter babies (like preemies), this model is an excellent option. Baby-related things can get heavy, which is why we like that the SnugRide 35 weighs less than other infant car seats. At only seven and a half pounds, petite parents will find this model more maneuverable, which is a plus when clicking the carrier in and out of the base. As we mentioned, the SnugRide is a top choice for small babies like twins and preemies, who will feel snug in the car seat thanks to the removable infant headrest and body cushion. The harness is highly adjustable, requires no rethreading, and can be used in four different positions. The SnugRide features a slightly higher height and weight limit, which will allow you to enjoy more extended use of this car seat. Keep in mind that base installation relies on hook latches, and ensuring the proper fit requires a bit more arm strength than with other models–something to keep in mind if you need to remove the base frequently. The SnugRide 35 meets or exceeds all the necessary safety standards for infant car seats, and it’s FAA-approved for air travel. We couldn’t think of a better name for the Safety 1st onBoard 35 Air 360, which got its name due to the 360 degrees of protection it provides infants. This model stands out because it has been crash tested from literally every impact–front, rear, side, and roll over–and has passed with flying colors. We love it for its safety, functionality, and comfort. The Safety 1st onBoard 35 Air 360 boasts many impressive features that will make getting baby safely from point A to point B a piece of cake. You can install it using a LATCH system or your car’s seat belt if you prefer, and it uses the same type of patented foam that race cars use for crash energy absorption. Its safety features merely start there. Parents like that the five-point harness is simple to adjust, as well as the fact that four harness heights mean that this car seat will grow with your child. It’s currently the only car seat with five layers of proven safety. You can machine wash and dry the seat pad, and the car seat’s handle features a comfort grip for easy carrying. And finally, the onBoard 35 Air 360 exceeds all US federal safety standards, as well as the European rollover standard. For parents who know that frequent car travel will be part of their baby’s life, this option’s safety features makes it a fantastic buy. Now let’s move on to our picks for our favorite convertible car seats. You may have guessed already from its name, but a convertible seat allows you to change riding modes. They transition from rear-facing infant and toddler seats to forward facing for bigger kids. Sometimes this type of seat can even transition into a booster seat, and they hold children up to 65 pounds. 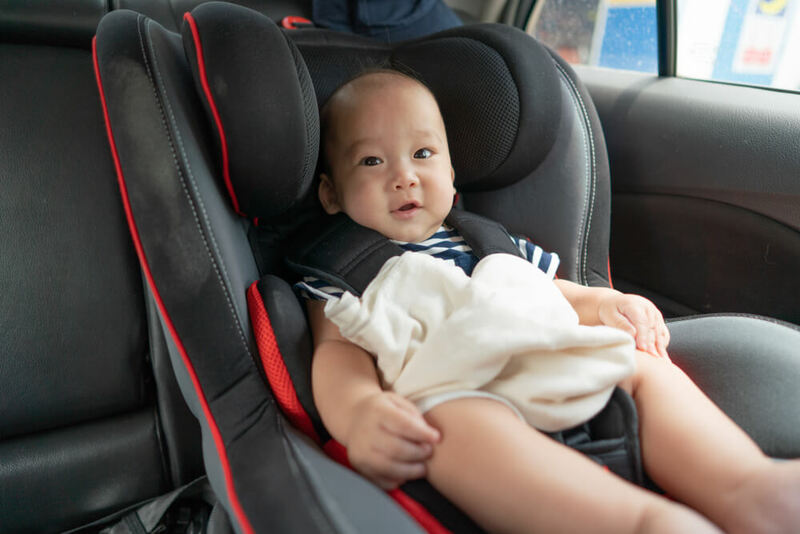 You may be wondering what the difference between a convertible car seat and an infant car seat is since both are appropriate for young babies. You probably think it would be better to buy the convertible seat since newborns can use them and you can get more extended use out of this type of chair. 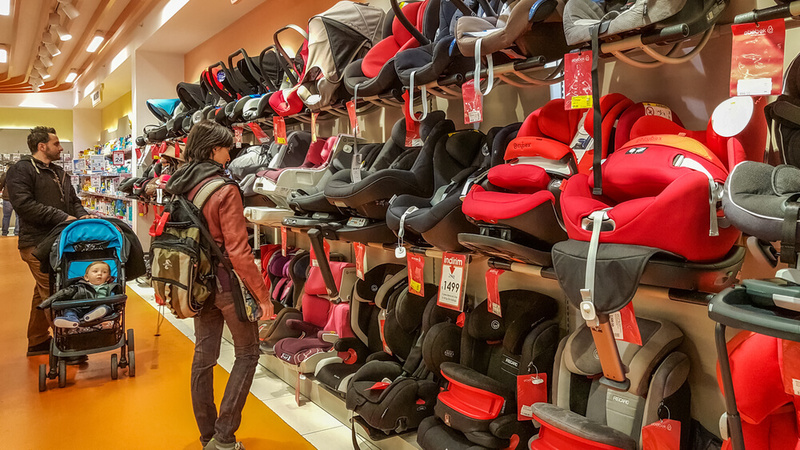 Starting with a convertible seat may indeed seem more cost efficient, but infant seats have a distinct advantage that motivates parents to buy them. Infant car seats, unlike convertible car seats, come with a detachable base and carrying handle. And this is a huge plus for new parents. Because everyone knows that the number one infant rule is never to wake a sleeping baby. Babies fall asleep easily in cars, and infant seats let you remove the whole unit from the base and either snap it into a stroller or carry it. This setup allows sleeping babies to stay asleep, which is something you don’t get with convertible seats. Many parents opt for convertible car seats anyways, merely because they can use it for much longer than an infant seat. If you do decide on this type of seat, pay careful attention to settings like strap placement and recline, which have to be changed depending on the mode you use. So, what are the best convertible car seats? If you’re looking for an item that will cut down on the mass of baby things piling up around you, this car seat is it. The Graco 4ever 4-in-1 car seat will accompany your baby from their first days until well into childhood, and parents rave about this economical, practical model that eliminates the need for any other product for car travel. Among families who prefer this type of car seat, the Graco 4ever has stood the test of time–literally. Newborn babies can use the rear-facing modality, and when they get a little older, they transition to forward facing. But the fun doesn’t stop there–this seat also becomes a high back belt-positioning booster and backless booster seat. Graco delivered on this seat, which apart from being functional also provides impressive crash test ratings and safety features. Some of the safety features include a five-point safety harness and a LATCH system that secures the seat in one second. This car seat is also FAA approved for air travel. Convertible car seats’ versatility often means they lack features here and there, but this model is as close to perfect as we can find. It comes in a variety of colors and at an affordable price. The name of this convertible seat should give you a clue as to its features, which focus on supporting your child as they grow, especially for families that make extensive use of their car. It will transition with your kid from the time they’re a baby until the day they no longer need a car seat. One problem that convertible car seats often have is their size. Their versatility features generally mean a bulkier design, which is problematic in some smaller cars and for some seat types. The Safety 1st Grow and Go 3-in-1 actually has a somewhat slimmer design, making it more comfortable for passengers sharing the back seat. While approved for infant use, this seat may not be the best option for small babies. The rethread-only infant harness can pose a challenge when it comes to strapping in your baby correctly, and there’s always the issue of having to wake a sleeping infant to get them out of the car. It’s FAA approved as a harness seat, but that doesn’t mean it’s the best for flying. The seat is heavy and doesn’t fold up, so if you are flying extensively, this may not be the best choice for you. If you’re looking for no-brainer safety features, the Britax Marathon ClickTight seat is a game-changer. Parents rave about how easy it is to install this seat, its impressive safety system, and how it can be used as both a rear-facing infant seat and a forward-facing toddler seat for older kids. What stands out about the Britax ClickTight are its safety features. It boasts two layers of side impact protection, a durable steel frame, and an impact-absorbing base that, should your vehicle be involved in an accident, compresses to minimize the force of the crash. As such, this seat is top-rated by the NHTSA. New parents are sleep deprived and have a million things to do, which is why we love the extra reassurance this car seat provides. Britax’s ClickTight system makes knowing whether or not the base is secure painless and straightforward. Plus, the Click and Snug indicator clicks when the harness is properly tightened and adjusted for maximum peace of mind. Besides being incredibly simple to install, the Britax ClickTight features a twelve-position harness that changes with the easy push of a button. It doesn’t have a booster seat option like some other convertible car seats, but it will still last you well into the first few years of your child’s life. As we mentioned earlier, the American Academy of Pediatrics recommends keeping infants rear facing as long as possible, and the Graco Extend2Fit makes doing so particularly easy. If you’re looking for rear-facing seats that will keep your child in this position past two years old, this model is a fantastic choice that’s also very affordable. The Graco Extend2Fit indeed is a versatile car seat that doesn’t sacrifice comfort in the name of functionality. Indeed, this car seat’s features are not only well designed, but they also provide one of the coziest rides on the market. What kid won’t love the five inches of legroom that come with the Extend2Fit? Or the six-position recline feature that will grow as your little one does? The Extend2Fit also has a four-position extension panel, two crotch strap positions, and includes Fuss Free Harness Storage Pockets. The rear-facing setting accommodates children up to 50 pounds, well beyond the standard 40 pounds. And since having higher weight limits in rear-facing seats also means children will be taller, Graco has added five extra inches of legroom so that parents won’t have to worry about squishing their child’s legs. The Extend2Fit performs well in crash safety tests, thanks in part to its sturdy steel frame. You can adjust the harness and headrest with just a simple motion using the Simply Safe Adjust harness. All in all, the Graco Extend2Fit gives parents an excellent value-for-money car seat that will grow with the child. While it may seem like the day will never come when your child is too big for their convertible seat, eventually it will, and you’ll have to be ready with the next step: a booster car seat. Kids need a booster seat after they outgrow their convertible car seat because their bodies are still too small to be adequately protected by a vehicle’s seat belt system. The booster seat raises the child so that the car’s seat belt hits them in all the right places on their shoulder and lap, but it doesn’t much resemble an infant car seat. A word of caution–don’t be too eager to move your child from a harnessed seat to a booster seat. Even if you think they’re too old for the harnessed seat, if they are still within the height and weight limits, it’s best to seat them there regardless of their age. If you answer yes to all of these questions, the time has come. And once you make the switch, you should make use of a booster seat until your child is at least 4 feet 9 inches tall and somewhere between eight to twelve years old. Some can accommodate children up to 120 pounds. There are two types of front-facing booster seats: high back and backless. It’s essential to decide which one is right for your child before you shop. High back booster seats look more like their harnessed counterparts than backless ones do. They provide extra protection to the child’s head, neck, and back. They offer more support than backless booster seats. Backless booster seats are easy to install and remove, and they’re especially popular among parents because they take up less room in the car. If you’re looking for the best in safety and comfort (and you don’t mind spending a little extra to get it), look no further than the Britax Frontier ClickTight Harness-2-Booster car seat. This seat is money well spent, especially considering that it will serve your child for many years. Parents are big fans of this high-end booster seat. This seat is a great transitional buy that will allow you to keep your child in a five-point harness a little bit longer, which we love. 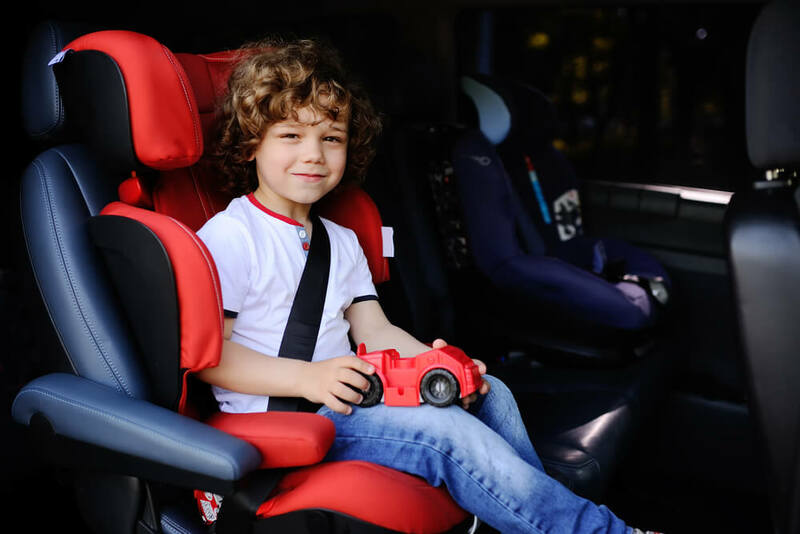 And in terms of safety, its shell is energy absorbing, and the headrest is lined with foam that provides security as well as a comfortable ride for your little one. The Frontier ClickTight includes many of the features parents enjoy in other Britax models, including the beloved ClickTight installation system that takes the guesswork out of knowing if the seat is installed correctly. It also has nine different headrest positions that are easy to adjust as your child grows, with straps that don’t require rethreading. All in all, while not one of the cheaper models on the market, parents are very pleased with this product due to its versatility, comfort, and functionality. If you’re looking for a car seat that will get the job done, the Britax Frontier is a fantastic investment. The Evenflo Maestro will be there with your child through all of their transitional stages because this booster seat transitions from rear-facing to forward facing. It also includes a seat belt guide that positions it across your child’s body when the time comes to make the switch to the full booster seat. The Maestro is a great, affordable option that will work for years. The Evenflo Maestro doesn’t have some of the bells and whistles that other seats have, but it meets or exceeds all US safety standards and provides side impact protection at around twice the required standard. It may not be flashy, but you can be assured that it will do its job in the event of an accident. Flashiness aside, it does have many great features that put it on our list. Its design allows for use from the time your child has grown out of their rear-facing seat until the time comes when they no longer need a safety seat. You will certainly get several years of use out of this booster seat. It does have some negatives, such as the fact that this seat won’t last as long for kids who are tall for their age. Tall kids have problems with this booster because there’s only one belt guide position and the headrest is not adjustable. But overall, if you’re looking for excellent safety features that won’t break the bank, the Maestro will do the trick. Plus, it’s not super heavy, and the narrow profile is superb for traveling on planes. The Graco Atlas 65 2-in-1 harness booster seat will grow with your child from the time when they are a toddler to several years later. You can start using it as a forward facing seat with a five-point harness system, and when the time comes, this model allows you to make the switch to a high back booster seat. This well-built car seat packs a lot of punch and boasts some features that are incredibly useful for busy parents. Besides slipping in the cup holders, there is no assembly required as it’s just one piece. Adjusting the Atlas seat is easy, and the seat has reclining abilities with two positions. You may need to purchase a traditional booster down the road (if your child still needs one past 100 pounds), as this model doesn’t convert to a backless booster. This model’s lack of a backless booster option is a pretty significant disadvantage, as many parents purchase it expecting this feature. That said, the Graco Atlas is FAA approved for airplane travel and meets or exceeds US safety standards. It exceeds the peak crash forces at two times the standard, which helps protect your little one should the worst occur. And the Insurance Institute for Highway Safety also awarded the Graco Atlas a “Best Bet” booster evaluation. Now that we’ve gotten through our top picks for the best infant, convertible, and booster car seats, it’s time to go over some important things to know before you shop. The National Highway Traffic Safety Administration holds all car seat brands to the same safety standards, which means that parents can rest assured knowing that whatever car seat they choose will meet rigorous safety standards. Some manufacturers endeavor to go the extra mile with additional measures, such as side impact protection. It’s helpful to familiarize yourself with some names that refer to features commonly found on car seats. Knowing how to use the following features properly is essential to ensuring your child’s safety in the vehicle. 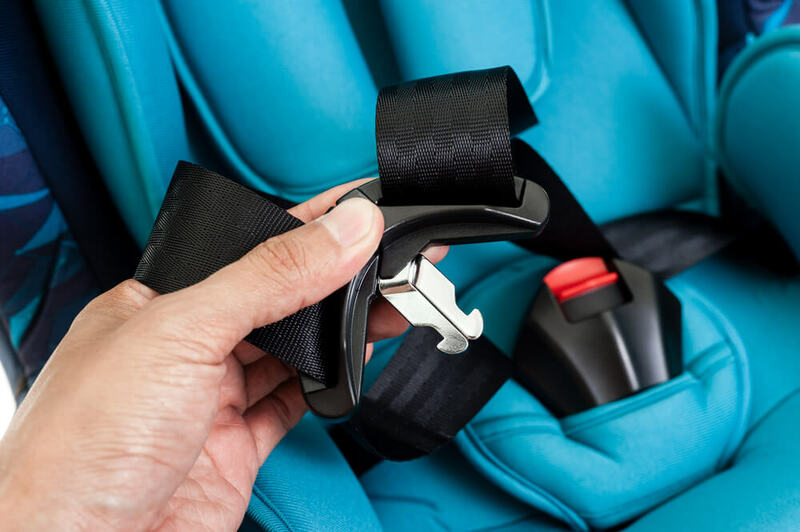 LATCH stands for Lower Anchor and Tethers for Children, and all harnessed child seats come with some form of LATCH connectors to secure the car seat base to the vehicle’s seat. They do so by attaching to anchors found in the vehicle seat’s fold. If your car was manufactured before 2002, which is the year that LATCH became standard in all vehicles, this is something you’ll have to keep in mind when shopping for car seats. The recline indicator is a critical feature in making sure rear-facing car seats are at the correct angle. They come in different forms and are generally either level lines or ball or bubble indicators. Your baby’s safety depends on achieving the correct angle, as different ages have different recline ranges. For example, infants must be more reclined so as not to obstruct their breathing. All car seats come with a harness system to secure your child that you’ll have to adjust as they grow. Changing the straps in many cases requires rethreading them through slots in the fabric, which many parents find difficult and time-consuming. If this is a concern, look for an external harness adjustment option. Whatever harness configuration you choose, you must know where it should sit on your child’s body depending on whether you are using a rear or forward-facing configuration. For rear, this means at or below the child’s shoulders, and for forward facing, the harness should be at or above the shoulders. The chest clip should be somewhere around armpit height. When your baby is properly secured, you won’t be able to pinch any of the harness’ fabric around the shoulder area. The top tether strap is only present in forward-facing car seats, which utilize this tether to secure the back of the car seat to the vehicle. This feature stabilizes the car seat’s shell and helps protect your child against head injuries, so you should make use of the top tether for added safety. A car seat is one of the most essential items you’ll buy for your baby, if not the most essential. It’s so critical, the hospital won’t let you leave without one. And since your child will use it for a long time–for years, potentially–it’s essential that you do your research carefully. We recommend reading up on as many options as possible before making a decision. Here’s wishing you and baby safe travels in whatever seat you choose.